Established in 2012, the ‘Enterprise Zone’ is at the heart of the Government’s long-term economic plan to support businesses, communities and the economy. There are now 48 zones currently active in the UK, these are establishing themselves as the driving force of local economies as they unlock key development sites, consolidate infrastructure, attract business and create jobs. The basic aim of the Enterprise Zone is to foster and promote economic activity that encourages growth and creates links to surrounding areas, both local and national. Whilst the focus is largely economic, a key component in the delivery of an Enterprise Zone is building a ‘vision’ and creating opportunities to initiate investment. ‘Visioning’ is a participatory process that is key to capturing ideas, aspirations and requirements for an area and helps set the scene for the future of the Enterprise Zone. Planning policies and strategic plans are also set out to underpin the vision and encourage accelerated development, infrastructure investment and to support long-term economic growth. Promote the attraction, offer and opportunity. We use a unique blend of illustrative mapping, marketing and visualisations to engage with communities and stakeholder groups to capture a collective vision. 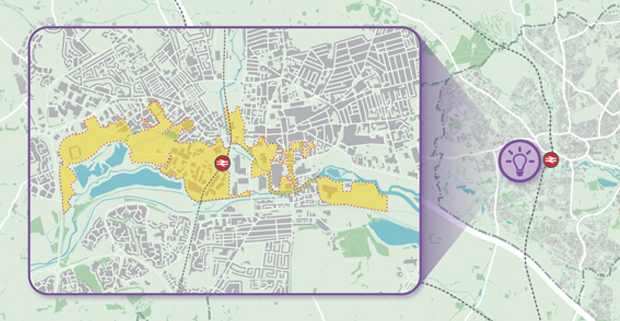 Our specialist skills are tailored to Create Maps, Promote Places and Build Visions.